There’s no denying it – Christmas is well and truly on its way. 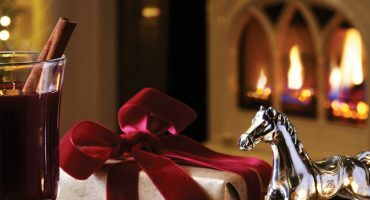 As we become immersed in shopping for presents, it won’t be long before we decorate our homes and get our fireplaces ready for the festive season. 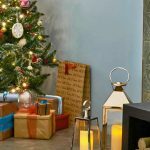 Here are a few ideas for how to dress your fireplace this Christmas. If your home is full of natural charm, all you need for this look below is a cosy fireplace, a comfortable chair and a small Christmas tree. Look out for gems such as old ice skates, and hang these on the wall for a simple Christmas vibe. 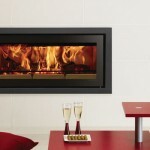 Now, put your feet up in front of the fire, and enjoy a hot festive drink. For a simple but effective result, go crafty with your decorations. You don’t need to make them yourself, but think cut out natural wooden reindeer, shabby chic baubles, and some simple letters on a mantel piece. To add to the look, opt for plush textures such as throws and knitted pillows, for an ultra-homely feel. 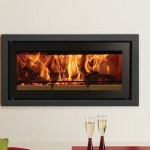 Stove shown: Stovax Huntingdon 30 with clear door. Shown with Grey Pembroke Mantel. Sometimes, sticking to a theme can bring the whole room together. In this example, a light and bright room with a coastal atmosphere can still have a festive touch. The white and silver decorations on the mantel continue that airy feel, while still keeping a Christmas vibe, and the bare wood and real foliage adds to the final result. 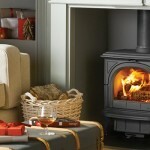 Stove shown: Yeoman CL5 – find out more about Yeoman products by heading to the website. If you lean toward more contemporary styling, a striking fireplace, such as the Gazco Reflex 75T, is complemented by homely textures and festive prints. Think rugs, cushions, and blankets for a subtle holiday ambience. Find out more about the Reflex 75T here. With these tips setting you up to decorate your fireplace for Christmas, don’t forget to enter our #FestiveFireside competition by sharing your festive fireplace photos to be in with the chance of winning a festive hamper. More details can be found on our blog. If you are interested in any of the products shown above, be sure to use our Find a Retailer page to find your local Stovax & Gazco stockist. Stay toasty this coming Christmas!